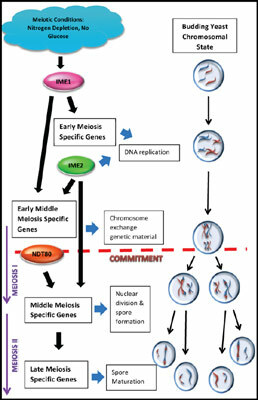 We present a review of the initiation of meiosis in budding yeast, Saccharomyces cerevisiae, specially focusing on the initiation stage before the commitment point. We discuss the molecular mechanisms involved in tight regulation of the initiation process using experimental facts and present a comprehensive discussion of the advantages and limitations of the available mathematical models on the meiosis initiation of budding yeast. We also succinctly review the biology of general meiosis initiation and the morphology of the modelling organism Saccharomyces cerevisiae which are helpful to understand the molecular mechanisms involved in context. While explaining the key molecular mechanisms, the available experimental literature and mathematical models open up emerging questions for future investigations. Although the complete molecular network and mechanisms of the meiosis initiation in budding yeast, which can be considered as the best understood meiosis modelling organism, are still not known, the current explanations can be beneficial for understanding key issues of the meiosis in multicellular organisms. Budding yeast, mitosis, mathematical models, nutrient dependence, Sporulation, Saccharomyces cerevisiae. Centre for Advanced Computational Solutions (C-fACS), Department of Molecular Biosciences, Lincoln University, Christchurch, New Zealand.